My name is Pauline Lake and I am one of two Trinity College students whom was chosen to work with Trinity College's Humanitarian Free Open Source Software (HFOSS) during the summer of 2010. That summer I worked with another Trinity College student and two high school teachers to learn and evaluate App Inventor’s potential in K-12 education. I am a firm believer of hands-on education and using things that students are interested in, to motivate them to want to learn. Because of this, I have become very passionate about teaching App Inventor to local high school students. 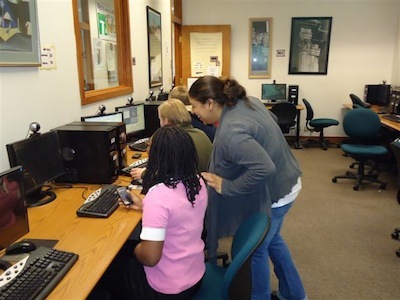 Following the summer 2010 program with HFOSS, I participated in a collaboration between HFOSS, Trinity College's Trinfo.Cafe, and the Greater Hartford Academy of Math and Science (GHAMAS) to create an after-school program on App Inventor for high school students. The collaboration resulted in the creation of the "I'll Write That App for You" program which has expanded over time and is now a six-week, eighteen-session, pilot program that uses App Inventor as an instructional tool to teach high school students basic Computer Science principles and introduce them to computational thinking. The program plays on the "cool" factor of working with Android smart phones in order to spark student interest. With the program created, I was asked to be the instructor for the program. I gladly accepted the offer and have since taken control of the program. After receiving positive feedback from the fall 2010 participants, I was insistent on running the program again in the summer of 2011. This time I changed the design of the program to be a total of six weeks and I spent the early weeks of the summer developing a full curriculum. I also asked a previous student to return as a teaching assistant. The students, who had been recruited from GHAMAS, completed App Inventor tutorials, created their own game apps, and completed a final project with an educational theme. The final projects included apps that assisted with math skills and note taking. The note taking app that was created was also developed on the tablet, in addition to the Android phone. The students presented their games and final projects at the final celebration showcase. Feedback showed that the students thought the newly added class handouts and small assignments were helpful. The students also thought that the new time frame for the program was accurate. In the fall of 2011, I applied to conduct a research project on App Inventor as part of the Community Learning Initative's Research Fellows Colloquium here at Trinity. My application was accepted and I was able to successfully run the after school program for a third time. Now, I am a junior, double majoring in Computer Science and Educational Studies. I have become very passionate about the I’ll Write That App for You program and have devoted many hours to developing this program. I was recently able to expand the program to work with another school in the Hartford area and beginning in February 2012, the program will run with students from Hartford Magnet Trinity College Academy (HMTCA), as part of a college preparatory program. As I approach my senior year at Trinity, my ultimate goal is to implement I’ll Write That App for You into other schools in the Hartford area. I believe that this program has a lot of potential in increasing student interest in Computer Science and I hope to have the opportunity to work with more high school students in the near future.